This airticle is aboot the French admeenistrative region o Breetany. For the historical duchy an province o Breetany, as well as the cultural aurie o Breetany, see Breetany. Breetany (Breton: Breizh, French: Bretagne, IPA: [bʁətaɲ] ( listen)); is ane o the 27 regions o Fraunce. It occupees a lairge peninsulae in the northwast o the kintra, lyin atween the Inglis Channel tae the north an the Bay o Biscay tae the sooth. Its caipital is Rennes. The region o Breetany is made up o 80% o the umwhile Duchy an Province o Breetany. The remainin 20% o the province is the Loire-Atlantique department which nou lees inside the Pays de la Loire region. Its caipital, Nantes, wis the historical caipital o the Duchy o Breetany. Pairt o the reason why Breetany wis split atween twa present-day regions wis tae avoid the rivalry atween Rennes an Nantes. Although Nantes wis the principal caipital o the Duchy o Breetany till the saxteent century, Rennes haed been the seat o the Duchy's supreme court o juistice atween 1560 an 1789. Rennes haed an aw been the admeenistrative caipital o the Intendant o Breetany atween 1689 an 1789, an Intendances wur the maist important admeenistrative units o the kinrick o Fraunce in the seiventeent an aichteent centuries. As for the provincial States o Breetany, a legislative body which haed oreeginally met ivery twa years in a different ceety o Breetany, that had met in Rennes anerlie atween 1728 an 1789, although no in the years 1730, 1758, an 1760. Despite that, the Chambre des comptes haed remained in Nantes till 1789. Housomeivver, frae 1381 till the end o the fifteent century Vannes (Gwened in Breton) haed served as the first admeenistrative caipital o the Duchy, remainin the seat o the Chambre des comptes till the 1490s, an an aw the seat o the "Parlement" till 1553 an then again atween 1675 an 1689. Although there wur previous plans tae create Régions oot o Départements, like the plan Clémentel (1919) or the Vichy regionalisation program (1941), these plans haed nae effect or wur abolished in 1945. The current French Regions date frae 1956, they wur creatit bi gatherin Departements thegither. In Breetany, this will lead tae the creation o the Région Bretagne which gathered anerlie 4 oot o the 5 historical Breton départements. Some fowk in Breetany an Nantes continue tae protest against the current diveesion o Breetany an wad like to see Loire-Atlantique combined wi the region o Breetany in order tae reunify the historic aurie o Breetany. Housomeivver, reunification raises ither questions: first, wha tae dae wi the rump Pays de la Loire region, an seicont, which ceety shoud be chosen as the caipital o such a reunifeed Breetany. The name o Breetany derives frae settlers frae Great Breetain, who fled that island in the wake o the Anglo-Saxon conquest o Ingland atween the fift an seivent centuries. Unlike the rest o Fraunce an Breetany, Lawer Breetany (roughly, wast o a bundary frae Saint Brieuc to Vannes) haes maintained a destinctly Celtic leid, Breton, which is relatit tae Cornish an Welsh. It wis the dominant leid in Lawer, or wastren, Breetany till the mid-20t century. It haes been grantit regional leid status an revival efforts are unnerwa. In Upper, or eastren, Breetany, the traditional leid is Gallo, an Oïl leid, which haes an aw received regional recognition an is in the process o being revived. 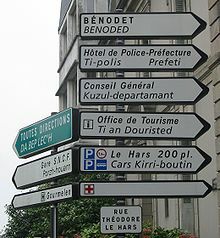 The French admeenistration nou allous for some Breton or Gallo tae be uised bi the region an its communes, in road signs an names o touns an ceeties, alangside the offeecial French version. The twa regional leids are an aw taught in some schuils, an mony fowklore associations an clubs are tryin tae revive them. Breetany haes historically been a stranghauld o the Roman Catholic Kirk, an its rates o church attendance hae tendit tae be considerably heicher than the naitional average. Housomeivver, in recent years the influence o the kirk haes declined. Breetany is admeenistered bi the Regional Cooncil o Breetany. 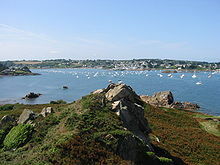 There are several airports in Brittany servin destinations in Fraunce an Ingland. TGV train services link the region wi ceeties such as Paris, Lyon, Marseille, an Lille in ither regions o Fraunce. In addition there are ferry services that tak passengers, vehicles an freight tae Ireland, England, an the Channel Islands. The follaein table is the leet o touns in Breettany wi a population ower 15,000 inhabitants. Three Breton clubs play in the Ligue 1, the top flicht o French fitbaa: Stade Brestois, Stade Rennais an FC Lorient. En Avant Guingamp play in Ligue 2, an Vannes in the third tier the Championnat National. This page wis last eeditit on 15 Apryle 2017, at 03:43.